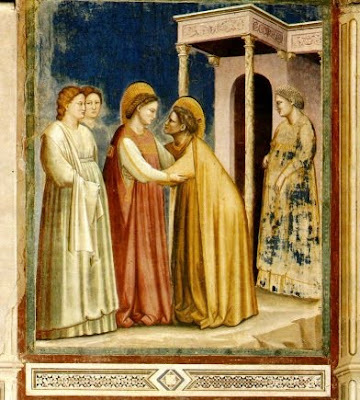 Feast of the Visitation of the Blessed Virgin Mary: "how does this happen to me, that the mother of my Lord should come to me?" Much of life is seeking what we want, what we think we need. Sometimes we can form our lives so much around what we want that we can forget other people and other things and, in so doing, forget something very important about loving ourselves: we also need other people and the love that they can give to us. This too is necessary for our happiness. Sometimes people who love us very much will tolerate selfishness perhaps even for a very long time because of their love for us. The Lord's relationship with us is different: it is always about Him, not us. The blind man wants his sight and is persistent in demanding a miracle. He is very clear about exactly what he wants from Jesus: "I want to see". But the reason he is able to make this demand for the restoration of the sight that he wants is because he has received from God what he needs: faith. He believes that Jesus has the power of God to heal him. he has put his faith in Jesus as God. "Go, your faith has saved you". The sight of his eyes that the blind man wanted restored was merely a physical, worldly confirmation that he had the one thing necessary: Jesus through faith. Our relationship with Christ is different than all other relationships because it is about Him and what He wants and not about us and what we want. It is about Him because He is what we truly need. Let us pray for ourselves that we may always truly want through love the One we truly need, and can only possess, through faith. "Rely not on your strength"
The gift of faith remains in one who has not sinned against it. But "faith apart from works is dead": when it is deprived of hope and love, faith does not fully unite the believer to Christ and does not make him a living member of his Body.
" ... serve the LORD ... "
The very differences which the Lord has willed to put between the members of his body serve its unity and mission. For "in the Church there is diversity of ministry but unity of mission. To the apostles and their successors Christ has entrusted the office of teaching, sanctifying and governing in his name and by his power. But the laity are made to share in the priestly, prophetical, and kingly office of Christ; they have therefore, in the Church and in the world, their own assignment in the mission of the whole People of God." Finally, "from both groups [hierarchy and laity] there exist Christian faithful who are consecrated to God in their own special manner and serve the salvific mission of the Church through the profession of the evangelical counsels." "All wisdom comes from the LORD"
"When the Church asks publicly and authoritatively in the name of Jesus Christ that a person or object be protected against the power of the Evil One and withdrawn from his dominion, it is called exorcism. Jesus performed exorcisms and from him the Church has received the power and office of exorcizing. In a simple form, exorcism is performed at the celebration of Baptism. The solemn exorcism, called "a major exorcism," can be performed only by a priest and with the permission of the bishop. The priest must proceed with prudence, strictly observing the rules established by the Church. Exorcism is directed at the expulsion of demons or to the liberation from demonic possession through the spiritual authority which Jesus entrusted to his Church. Illness, especially psychological illness, is a very different matter; treating this is the concern of medical science. Therefore, before an exorcism is performed, it is important to ascertain that one is dealing with the presence of the Evil One, and not an illness." Pentecost: "they were all filled with the Holy Spirit"
... they were all in one place together. And suddenly there came from the sky a noise like a strong driving wind, and it filled the entire house in which they were. Then there appeared to them tongues as of fire, which parted and came to rest on each one of them. The term "Spirit" translates the Hebrew word ruah, which, in its primary sense, means breath, air, wind. Jesus indeed uses the sensory image of the wind to suggest to Nicodemus the transcendent newness of him who is personally God's breath, the divine Spirit. On the other hand, "Spirit" and "Holy" are divine attributes common to the three divine persons. By joining the two terms, Scripture, liturgy, and theological language designate the inexpressible person of the Holy Spirit, without any possible equivocation with other uses of the terms "spirit" and "holy." 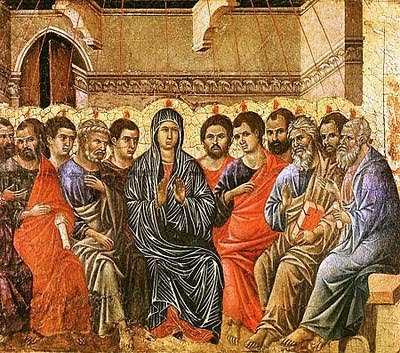 For MCITL Pentecost reflection click here. St. Peter's conversion after he had denied his master three times bears witness to this. Jesus' look of infinite mercy drew tears of repentance from Peter and, after the Lord's resurrection, a threefold affirmation of love for him. The second conversion also has a communitarian dimension, as is clear in the Lord's call to a whole Church: "Repent!" " ... you must also bear witness ... "
but also for those who will believe in me through their word"
"St. Catherine of Siena said to 'those who are scandalized and rebel against what happens to them': "Everything comes from love, all is ordained for the salvation of man, God does nothing without this goal in mind." "Dame Julian of Norwich: 'Here I was taught by the grace of God that I should steadfastly keep me in the faith... and that at the same time I should take my stand on and earnestly believe in what our Lord shewed in this time - that 'all manner [of] thing shall be well.' "
I know that after my departure savage wolves will come among you, and they will not spare the flock. And from your own group, men will come forward perverting the truth to draw the disciples away after them. 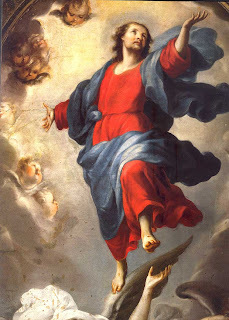 The Solemnity of the Ascension: "The Lord Jesus was taken up"
"Jesus' final apparition ends with the irreversible entry of his humanity into divine glory, symbolized by the cloud and by heaven, where he is seated from that time forward at God's right hand. (Cf. Acts 1:9; 2:33; 7:56; Lk 9:34-35; 24:51; Ex 13:22; Mk 16:19; Ps 110:1) Only in a wholly exceptional and unique way would Jesus show himself to Paul 'as to one untimely born,' in a last apparition that established him as an apostle. (1 Cor 15:8; cf. 9:1; Gal 1:16).
" ... you unknowingly worship ... "
The Catholic Church recognizes in other religions that search, among shadows and images, for the God who is unknown yet near since he gives life and breath and all things and wants all men to be saved. 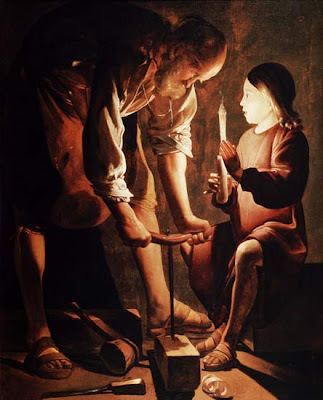 Thus, the Church considers all goodness and truth found in these religions as "a preparation for the Gospel and given by him who enlightens all men that they may at length have life." All Christ's riches "are for every individual and are everybody's property." Christ did not live his life for himself but for us, from his Incarnation "for us men and for our salvation" to his death "for our sins" and Resurrection "for our justification". He is still "our advocate with the Father", who "always lives to make intercession" for us. He remains ever "in the presence of God on our behalf, bringing before him all that he lived and suffered for us." " they handed on ... the decisions reached by the Apostles "
Ss Philip and James: "I am reminding you, brothers and sisters, of the Gospel I preached to you"
I handed on to you as of first importance what I also received: that Christ died for our sins in accordance with the Scriptures; that he was buried; in accordance with the Scriptures; that he appeared to Cephas, then to the Twelve. S Joseph the Worker: "The Father who dwells in me is doing his works." "Have I been with you for so long a time and you still do not know me, Philip? Whoever has seen me has seen the Father. How can you say, 'Show us the Father'? Do you not believe that I am in the Father and the Father is in me? The words that I speak to you I do not speak on my own. The Father who dwells in me is doing his works.